(Rugosa) Beautiful, pure white, semi-double, papery blooms with a very strong scent. Foliage is dark green and holds well, to produce good autumnal colour, sets quite large hips intermittently and the plant is dense and bushy. Ideal for woodland planting and growing as a hedge. Bred by Cochet-Cochet. (Bourbon) A fine shrub with glossy foliage bearing full flowers of pure white with a strong fragrance. Summer and autumn flowering. (Modern Shrub) We are delighted to have named this rose, at the request of Bishop Peter Nott who had the honour of marrying The Earl and Countess of Wessex. A beautiful cream coloured shrub rose of excellent health and vigour. The flowers are large and very highly fragrant; produced all summer against dark, shiny foliage. (Pimpinellifolia) One of the early flowering roses, this rose doesn't disappoint, with delicate single, white flowers with prominent yellow stamens. complimented with fern-like foliage and many bristles. With a procumbent habit and shade tolerance this lovely spring flowering rose can be placed in most areas of the garden. 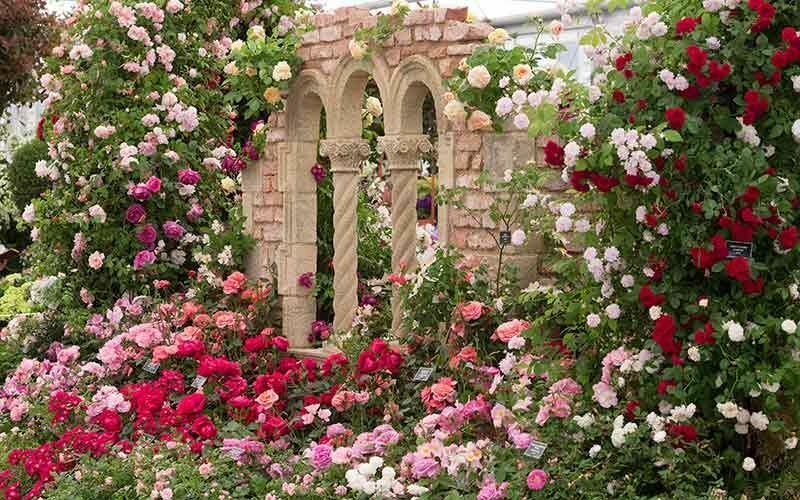 (Floribunda) A superb rose of very tidy habit. With shapely double flowers of flesh-pink that change to cream as flowers age. This delightful little rose has a pleasing perfume and healthy, glossy foliage. Perfect for growing in tubs or as a bedding rose, planted en-masse this variety really creates a glorious display. (Sericea Hybrid) A useful rose because of its long flowering period and the ornamental value of its orange hips. The flowers are pure white and single. (Modern Shrub) A delightful, large ivory-white almost single rose with prominent golden-red stamens which is complemented with a delicious musk scent . The blooms are freely produced on a strong growing shrub which bears abundant dark green foliage. This rose is a real addition to any garden and if space is limited will comfortably grow in a container. Bred by Harwanna. (Hybrid Musk) Semi-double free flowering. Lemon to white flowers borne on long stems. (Modern Shrub) A medium-tall Floribunda producing large clusters of sizeable semi-double flowers of soft creamy-white with pronounced golden stamens when open. A mild fragrance. Growth, bushy, with ample dark green foliage. An ideal rose for bedding or for making a low growing hedge. This was introduced as part of the 200th Anniversary of The Battle of Trafalgar in 2005. Bred by Beales. (Modern Shrub) (Reputedly of Moyesii origin) A large shrub at its best in May and June when the arching branches are covered with large creamy-white blooms. An excellent flowering rose of great beauty. (Modern Shrub) A Beautiful rose producing semi-double, whitish-pink flowers massed amid healthy, glossy foliage. Once open the blooms reveal the prominent yellow stamens, which is a real magnet to wildlife. Can be grown as a small ground cover or alternatively looks very effective growing through a hedgerow. Bred by Le Grice. (Hybrid Musk) Semi-double, creamy pink paling to white flowers with a good fragrance. One of the best of the group. Large clusters of white semi-double flowers. Pale pink buds. Repeat to continuous flowering. Arching growth could climb. Glossy leaves. (Hybrid Musk) Trusses of very double creamy-white flowers which look well against its dark glossy leaves, strongly scented. Creates a stunning hedge.